Please Join us for Worship on Sunday mornings. Summer hours: June 4, 2017 through September 3, 2017 at 7:30 a.m. or 9:00 a.m.
Fall Hours: September 10, 2017 through May 27, 2018 at 8:00 a.m. or 10:30 a.m.
Click on the Contact Us tab for directions. 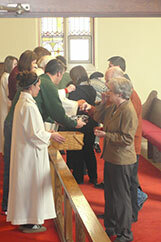 Holy Communion is served at all Sunday worship services. All who believe that Christ is present in the bread and wine are welcome to receive communion. Grape juice is available for those desiring it, as well as gluten free hosts. Coffee Hour is served between worship services on Sunday mornings. Join us for hot coffee and delicious treats each week. The “Cry Room” is located right outside the Sanctuary doors and is equipped with a rocking chair, changing table, diapering supplies, and children’s books. A speaker is also available so that the worship service can be heard. 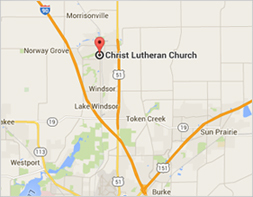 At Christ Lutheran, please come as you are! We have those who attend worship services in casual attire, as well as those who prefer to “dress up”. We would be happy to give you a tour of the building, answer questions, and fill you in on all the wonderful things that go on at Christ Lutheran on a weekly basis. Just ask an usher as you enter or leave worship services, or call the church office if you would like to speak with a Pastor during the week (846-4718). 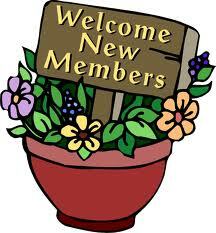 You can also email us with any questions you might have: office@christlutherandeforest.org.